Anne Mayer Hesse grew up in Cincinnati, Ohio; received a BS in English education from Miami University in Oxford, Ohio, a Master's in special education from the University of Cincinnati, and certification to teach art from Seminole Community College in Orlando, Florida. After dabbling in a variety of art forms, Anne made her mark in the field of contemporary basketry, teaching and creating innovative approaches to construction. Her work is included in many private and corporate collections. In the late 1980s, Anne's focus turned to creating figures, and that is where her passion has remained. She has been the subject of numerous newspaper and magazine articles, was commissioned to create a 3½ foot doll for the television series "Central Park West," had a small piece purchased for the film "Grumpier Old Men," and has twice been invited to participate in the White House Christmas Collection of American artists, (1992 and 1999). 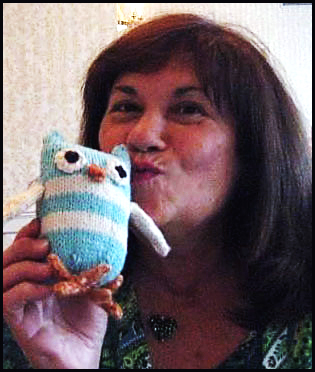 Anne's work can be seen in Susanna Oroyan's books, "Anatomy of a Doll," "Designing the Doll," and "Finishing the Doll." Anne's work is also represented in three of Patti Culea's books and in Martha Le Van's "Making Creative Cloth Dolls." Anne was the featured doll artist in the Spring 2006 issue of Art Doll Quarterly. Anne collaborated with Patti Culea and Laura McCabe in co-authoring a book, "Beading for Cloth Dolls." Anne has been beading and teaching bead designs for the past 10 years and has taught at the Bead and Button Show for the past 6 years, as well as other bead stores.